Any student of Egyptology would love to get lost in the MFA’s corridors and storage rooms, discovering the many faces of ancient Egyptians, statues and tomb reliefs unearthed by George A. Reisner at Giza. 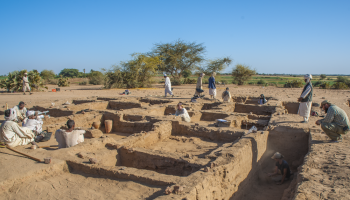 But Reisner didn’t only deploy his herculean prowess in Egypt: among his many archaeological endeavors, he also excavated some of the major sites of Sudanese and Nubian history, such as Kerma, Djebel Barkal and the royal cemeteries of el-Kurru, Nuri, and Meroe. The fantastic objects he and his team discovered are now curated in the Sudan National Museum and the Boston MFA, and have since then graced many exhibitions on ancient Sudan. Suffice is to say, the MFA was on top of my list to kick start my North American museum tour. My main objective was to document the few textiles found at Meroe in the royal cemetery. Rare and very fragmented, they are nonetheless of incredible importance, as they are the only witnesses of a production destined to be used by the royal family. One piece in particular displays an exceptional quality and unique tapestry designs which I hope to make the object of a future article. The other aspect of my work at the MFA was to study the textile remains discovered in Kerma. 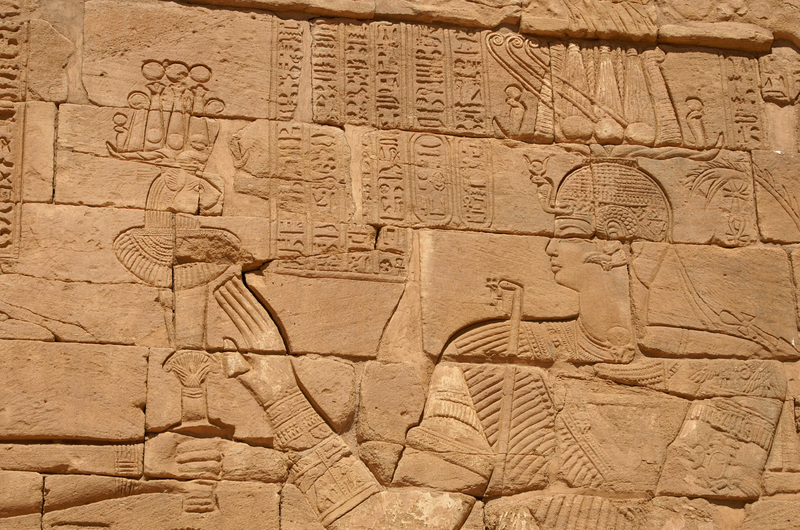 Much earlier in date (c. 2400–1550 B.C.E. 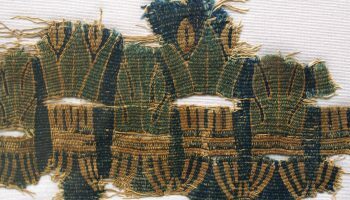 ), these textiles show interesting features bearing the seeds of future developments and techniques which we see blossoming in the Meroitic period. It is notably the case for the openwork nets used to nestle the iconic Kerma beakers, to carry and hang them in buildings. 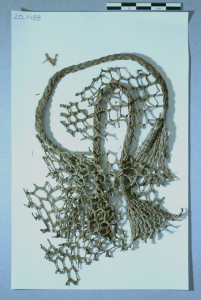 Made in a macramé technique, the nets are built with a network of knotted linen yarns. The threads form a lattice pattern of lozenges or hexagons, sometimes enhanced with the application of green pigments. Such a structure calls to mind the Meroitic openwork borders which lined the bottom of many cotton textiles. Made to exploit the long warp lengths left after weaving on a warp-weighted loom, these borders also exhibit a lattice of geometrical shapes. They are however made with a different technique, without any knots, which remains to my knowledge unique to Meroitic Sudan. I was therefore interested in studying their so-called ancestors and try to trace the origin of this openwork tradition. I knew the Kerma textiles from mentions and photographs in Reisner’s Excavation at Kerma (1923-1924), but I didn’t really know the level of conservation and the size of the remains. The 1920’s photographs were also not very conducive to detailed examinations. A brief survey in the MFA’s database informed me than many more textile fragments were brought to the museum than was reported in the publication. Thanks to Denise Doxey and Inês Torres from the Arts of the Ancient World Department and Meredith Montague from the Gabriella and Leo Beranek Textile Conservation Lab, I was able to study many of them in great details. And what a chance! Their conservation is really astonishing: the textiles, if quite brittle to the touch, are preserved in large fragments allowing careful manipulation. Hundreds of photographs and technical notes later, I became convinced of the necessity to establish a true textile catalog documenting this exceptional corpus. Such a publication would of course have the duty to report the textiles themselves, as the only remains of a textile tradition far more complex than previously imagined. But thanks to the incredibly rich archives assembled by Reisner and his team, it would also present the rare chance to associate the textiles to their context of use and function. 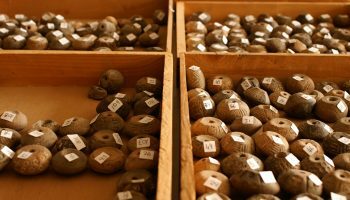 Recording the precise find spot of every archaeological objects – even the fragile and often disregarded textiles – seems obvious nowadays, but it hasn’t always been so in the early history of excavation in the Nile valley. As a result, hundreds of textile fragments are now stored in museums around the world without any indication of origin, let alone the precise context of discovery. 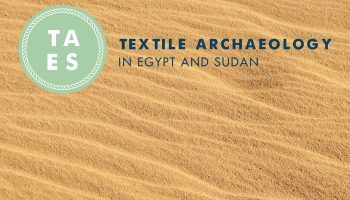 How many of the so-called “Coptic textiles” are now labelled “From Antinopolis, Egypt?”. 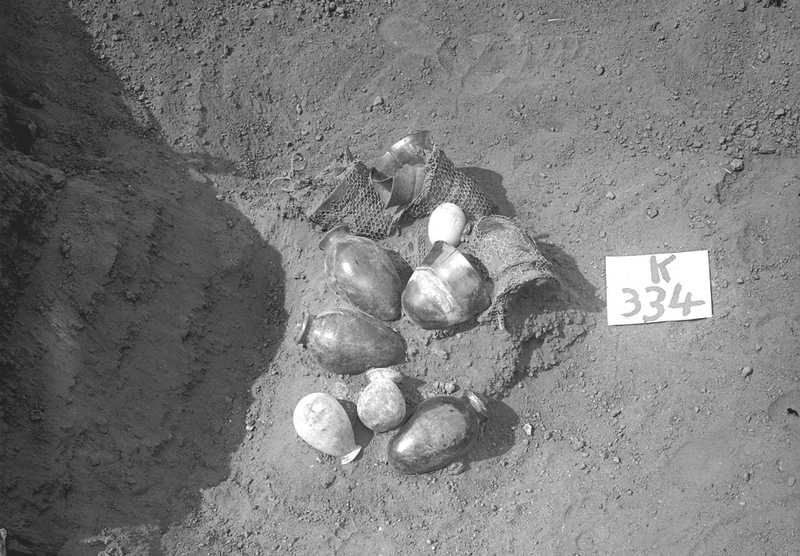 In the case of the pot nets mentioned above however, we often have the whole archaeological chain of evidence: the beaker and the net, as separate objects in the MFA collections, the excavation diary with inventory and tomb numbers, and the picture of the in situ find showing us the objects’ arrangement in the funerary deposit. 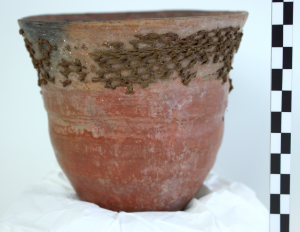 Sure, the excavators were apparently more interested in the pots, and therefore removed the intact nets… which broke in several fragments…But, they documented the deposit and kept all of the pieces. In several instances, they even secured the remaining fabrics on the pots themselves by gluing them in place. So all in all, this complete archaeological assemblage is full of interesting, previously unseen pieces, and highly usable even by the modern academic standards. I cannot wait to pursue my study in Reisner’s footsteps, and learn more about ancient Kerma and its crafts. P.S. A great thank you to Inês Torres for digging into the cupboards of the MFA, in the stores and in the digital archives files. I am an archaeologist, researcher and post-doctoral fellow at the Centre for Textile Research, Copenhagen University.